The Dolphins bullying scandal should make us reflect on what we expect from our athletes. When does locker-room behavior and on-the-field accepted aggression go too far? 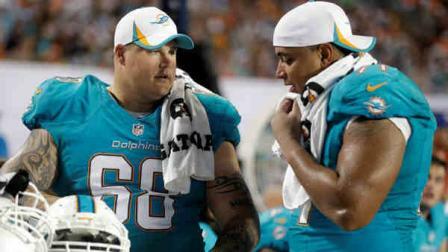 In the unfolding story of bullying and harassment allegations in the Dolphins organization, there are two facts repeated in almost every story: Richie Incognito, named “the dirtiest player in the NFL,” is no stranger to controversy and Jonathan Martin is a Stanford graduate whose parents are both Ivy League graduates. In some circles that would make him part of the elite. In football, that makes him a minority. And that very well may be the elephant in the room. Martin presumably had a privileged upbringing. The majority of professional football players cannot relate to that. They can relate to hard work. Most of the elite high school football players in Miami-Dade County attend struggling schools in poor neighborhoods. And sports are one of the relief valves, their verve and tenacity evident on that football field. The hope: always a college scholarship, one that will lead to an NFL draft. Those that make it to a college team, begin training. They practice harder than ever before. They play to win, not just the audience’s cheers and approval, but their schools expect them to win in order to sell more college football tickets, to sell more video games, more college merchandise. They win to improve their school’s ranking, to garner more attention, to attract more students, to fund research, and educational endeavors in which they do not often participate. They are trained to enter an arena where crowds cheer as they act like savages. We ask men to be incredibly violent and vicious. We ask them to be superhuman, to run faster and hit harder, to bash their heads, to run full speed and crash against a 350 pound man, also running full speed at him. We ask him to stay standing. We ask these men to inflict pain on their opponent and to play through their own pain, and not just excruciating pain, but the pain that comes from running on a broken ankle, throwing and catching a ball with broken fingers, sprained wrists, and bruised ribs. We expect these men to take whatever potion necessary, just to be able to mask the pain, while they inflict it on others. We celebrate the clashing of titans. The crashing of helmets. The superhuman strength necessary to cross the goal line. It is not that Martin lacked physical or mental strength. The Stanford grad was smart. He studied hard, attended fantastic schools, was a second round draft pick. But maybe, just maybe, there were other differences between Martin and his teammates. Differences only exacerbated by “the dirtiest player in the NFL” that is no stranger to repulsive behavior. Perhaps we shouldn’t be so surprised. In a sport that prizes mental and physical toughness, that prizes physical ability over all else, where savagery and violence is the norm, it may be just too much to ask players to leave that behavior on the field. Civility might be far too much to ask.